Oronce Finé, French mathematician and cartographer, created this map of the world in 1536. 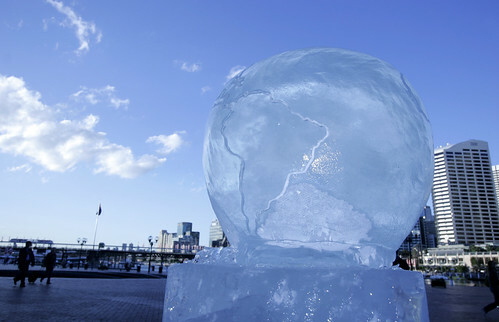 He used the Werner projection, also known as cordiform, which gives the earth a heart-like shape. It looks distorted, but it is actually more accurate than more common projections in some ways, because it keeps correct the distances from each pole and along all parallels. 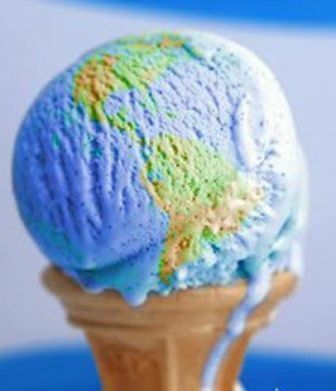 Considering that the Earth itself is round, it makes sense for a 2-D depiction of the Earth to be rounded as well. 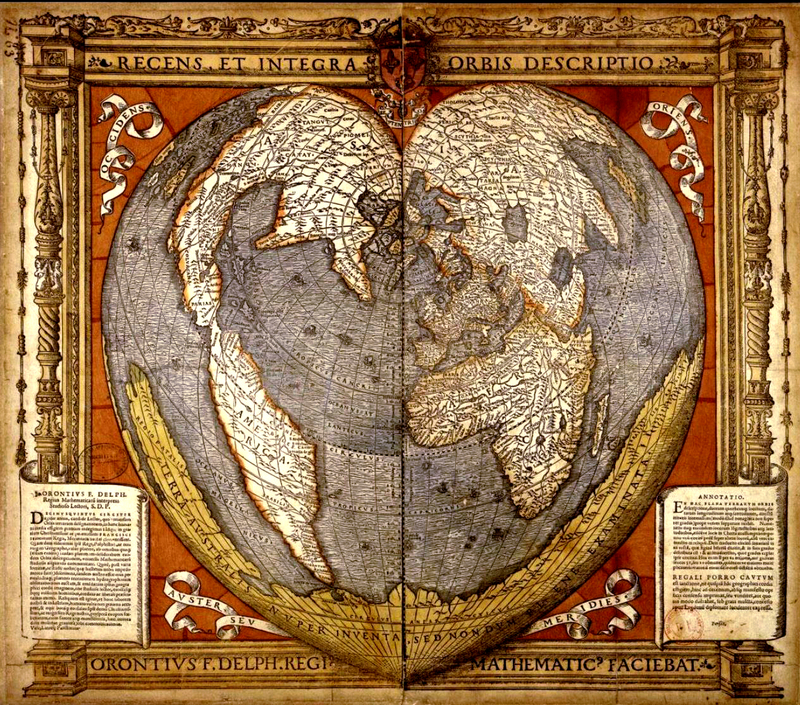 This Heart-Shaped Map reflects the imperfect cartographic knowledge of the time, when the world was still being fully explored. If you look closely, you will notice some curiosities. Only South America is named America. Across the top of the land mass at the top, covering North America and Asia, is written “Asia”. 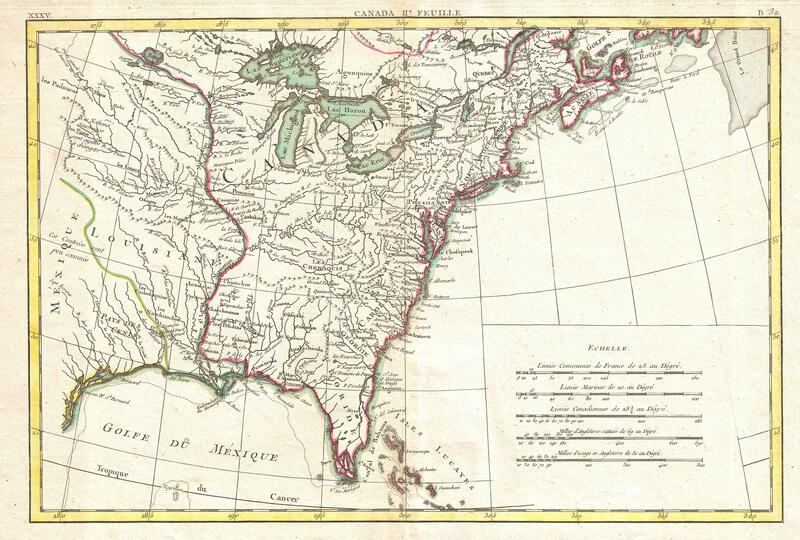 Finé believed that North America really was part of Asia, as Columbus had believed, and so he connected the two continents into one in his maps. At the bottom of the map is another interesting sight: Terra Australis. It has a name that sounds like Australia, but the location and rough shape of the continent of Antarctica. So what’s going on here? Well, Terra Australis (which just means Southern Land) was placed on a lot of maps before any European had discovered either Australia or Antarctica. 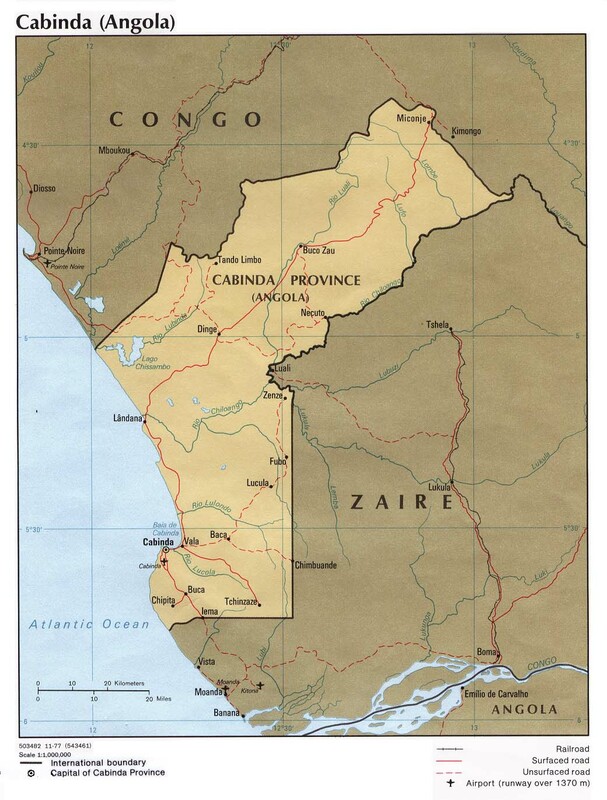 They simply believed that there HAD to be a big Southern continent to balance out all the land in the North. What is fascinating is that European explorers would actually find two Southern continents, proving right the hypothesis. 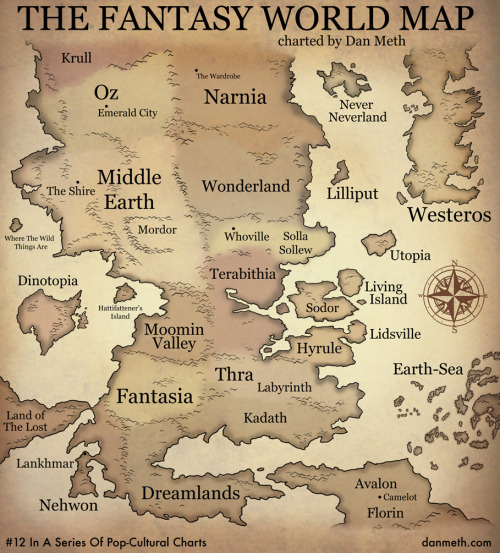 Maps during this age featured countless fictional islands and far-off kingdoms that explorers kept expecting to find but never did. But Terra Australis really did exist, even if it was two continents instead of one. Australia was discovered in the coming years, and it was given that name because it was not expected that a more Southern continent would be found. In the 19th century, explorers finally found Antarctica and realized that it was an entire continent, just in the same position as posited by Finé and others. Sadly, Australia had already taken its title away from it, so instead it was named Antarctica (“opposite to the North”). One of the most remarkable cities that I’ve visited is Rome, Italy. I was amazed at how many beautiful and impressive sights there are to see, from all different eras in the city’s long history, stretching back over 2000 years. There is the mostly intact Colosseum, which held gladiator battles in the days of ancient Rome. There are countless churches from the renaissance period showcasing a variety of architectural styles. And more recently, there is the visually stunning Fountain of Trevi, completed in 1762, and the Vittoriano monument from the early 20th century. 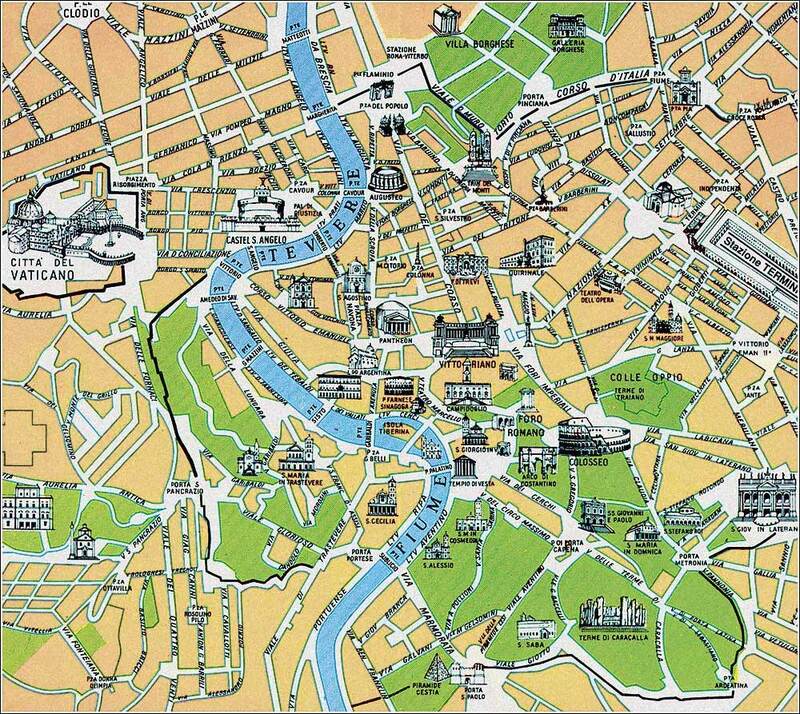 But for today, let’s look at a couple of maps of Rome. The first one is from 1642, by Matthus Merian, and it shows Rome during the glory days of the Italian Renaissance. East is at the top. I linked to the highest resolution version of the map because it’s worth zooming in and really checking out all the sites. You can see the Colosseum in the upper middle, with the Roman Forum in the open space underneath. If you move down and left from the Colosseum, you can find a tall column, which is the Trajan Column commemorating the Roman Emperor Trajan’s victory in the Dacian Wars in the 2nd century A.D. The Column is still there today. In the bottom left of the above picture is St. Peter’s Basilica, St. Peter’s Square, and the Apostolic Palace. This area, which would eventually become the Vatican, is the headquarters of the Catholic Church. Can you spot the differences and similarities? There are some additions which weren’t built in 1642, such as the large Vittoriano toward the center of the map and the Fountain of Trevi above it. But the Colosseo (Colosseum) is still in place with the Forum nearby. And on the left-hand side of the river is the familiar Citta del Vaticano, or Vatican City. 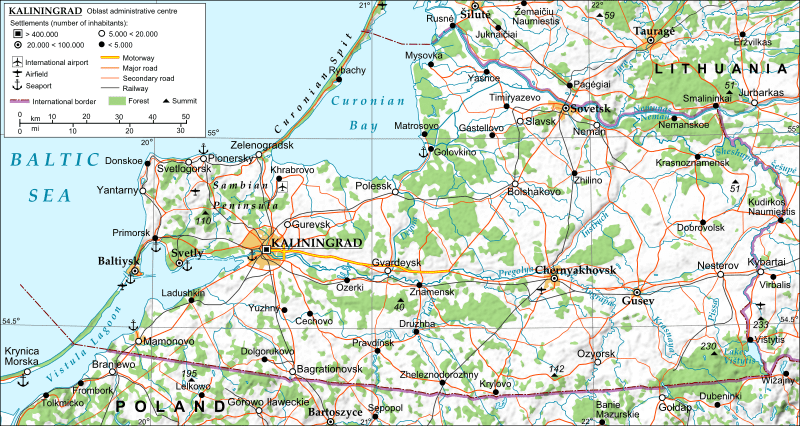 Today, it is an independent country, the smallest in the world at only 0.17 square miles. How does such a small area function as an independent country, especially when surrounded completely by the city of Rome? And why is it not just part of Italy, anyway? Happy mapping and happy traveling! 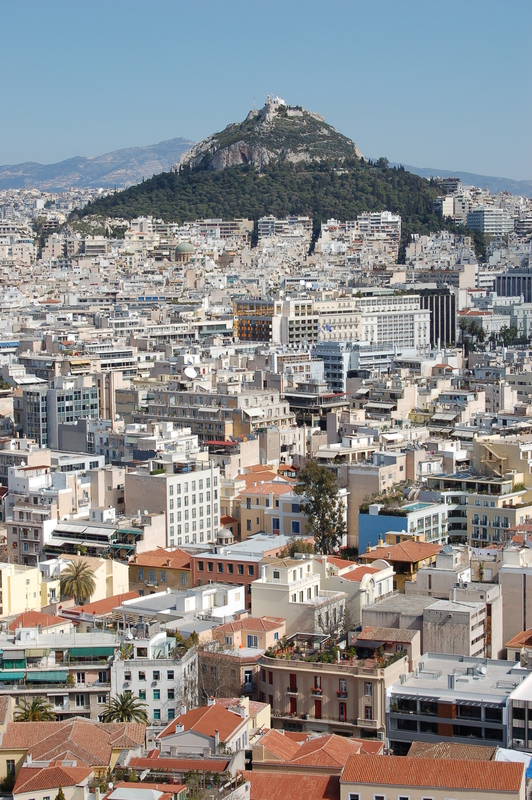 The city-state of Athens was definitely the place to be from around 500 BC to 322 BC. It was a democracy that gave birth to countless intellectual and artistic achievements, from philosophy to sculpture to science. For this reason, Athens has often been referred to as the Cradle of Western Civilization. The Acropolis, or “High City”, was the location for many of the city’s religious temples. The ancient Greeks paid lots of attention to their pantheon of gods, especially the goddess Athena, who was believed to be the city’s protector. The Parthenon, the most prominent temple on the Acropolis, is dedicated to her. I visited it in the fall of 2006 while studying for a semester in Athens, and although it was under restoration and I could not get too close to it, the sight of it still filled me with awe. The Agora, meanwhile, was the marketplace of the city, and its central location reveals much about how the ancient Greeks lived. Everyone went to the marketplace to buy and sell goods, but it was also a marketplace of ideas, where philosophers and politicians alike could make speeches to the public. In an age when most people were on foot, the marketplace had to be centrally located so that all the people of the city could congregate there. 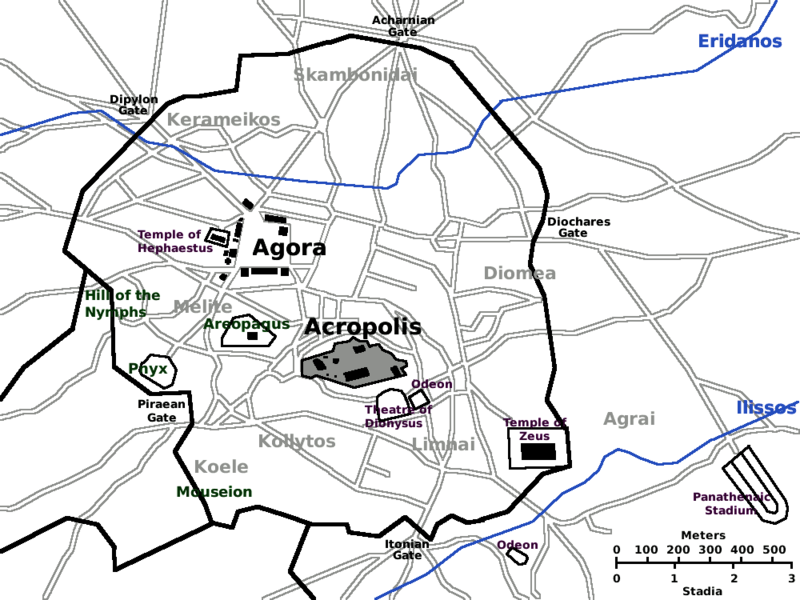 Below is another map showing the larger area of ancient Athens. In the southwest, on the ocean, is the port of Piraeus. Even today, this still serves as the major port of this region of Greece, and it can be reached by metro from Athens. In ancient times, they had to travel by foot or horse, but at least they had Long Walls to protect them from potential invading barbarians. I guess we can’t expect Athens to stay unchanged for over two thousand years, can we? The land of Hyrule is the setting for nearly all of the games in the popular Legend of Zelda videogame series. But even though the setting stays the same, the world looks different in every game. Many regions and towns appear again and again in the Zelda games, but their locations move around. Some places expand and take on new importance, while others disappear altogether. And some games alter the world so much that it becomes completely unrecognizable. Wind Waker, for example, is set in a flooded world of scattered islands, while much of the action in Skyward Sword takes place on floating islands in the sky. Why does the world of Hyrule change so much from game to game? It could be due to the fact that each game in the series is set in a different generation, with a new Link becoming the hero in each one. 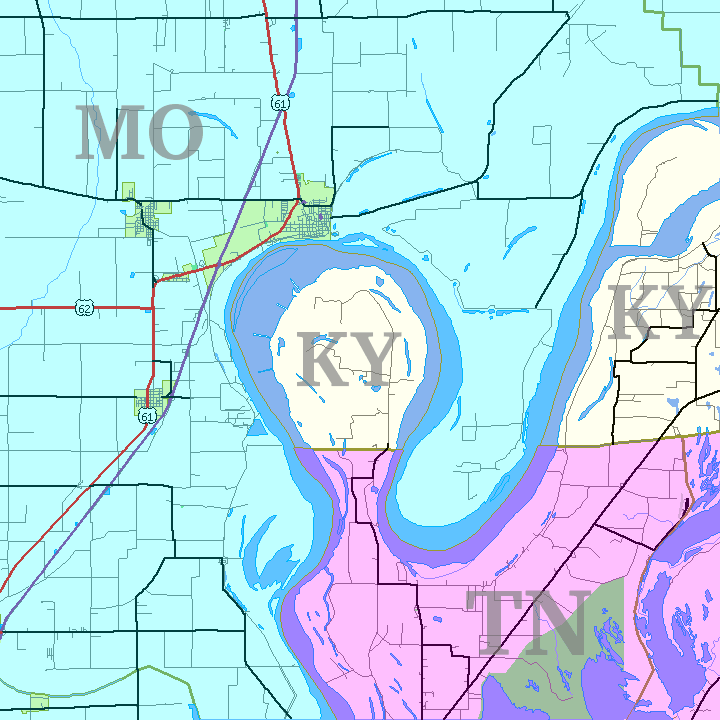 Maybe events that occur in between games cause the topography of the world to change and towns to be relocated. But more likely, the creators of a new game in the series just want to remake the world so the experience feels new and interesting. As much fun as the Zelda games are, it would eventually get boring to play in the exact same world again and again. Anyway, today I want to compare the maps in two different Zelda games: A Link to the Past and Ocarina of Time. A Link to the Past came out in 1991 for SNES, and Ocarina of Time came out in 1998 for the Nintendo 64. Technology changed quite a bit in the intervening years. Ocarina of Time moved the franchise from 2-D to 3-D, allowing bigger, more complex worlds. For the first time, Link could explore the world at his eye level, rather than the top-down view of A Link to the Past. The graphics in A Link to the Past would be primitive by today’s standards, but the game is undoubtedly a classic due to its creative gameplay. 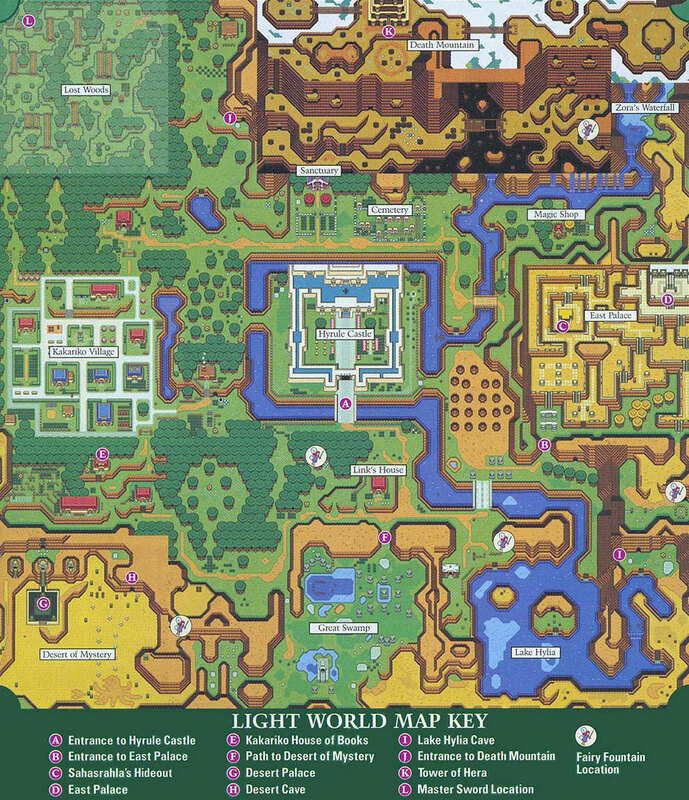 Hyrule is in fact split in two between the Light World (seen above), and the Dark World. Link can travel between the two worlds to solve puzzles, finding that the shape of the land is generally the same, but there are important differences between them. For example, where there is a desert in the Light World is a marsh called Misery Mire in the Dark World. Notice that many of these places are familiar, such as Lake Hylia, the Lost Woods, and Hyrule Castle. However, they have all moved their location and changed their appearance. There are also new places which didn’t exist before, such as Gerudo’s Valley in the West, although it somewhat resembles the Desert of Mystery from A Link to the Past. The Hyrule of Ocarina of Time is more expansive, and for the first time, Link has the ability to ride a horse across the central field to get between locations. The evolution of the world from game to game has also given Link access to a boat to sail between islands in Wind Waker and a bird to fly between floating islands in Skyward Sword. That will be all for our videogame cartography lesson today… stay tuned for the next installment!